May is a very special month of the year for us up here in the “north country.” Summer has finally arrived and the wonderful planting season has come again. As a farmer, I enjoy putting seeds into the ground, and seeing new life come forth. With the miracle of new life coming forth, comes the promise of another harvest. May is also very special for two other reasons, one is Mother’s Day, and the second is my wife’s birthday. The Lord has blessed me with a wonderful wife. I could never have hoped for a better one. Joanne has been a very godly mother and wife over these many years. So when May comes around every year, I try to do something special to bless her. Sometimes I may take her out to dinner or buy her some flowers. That is fine and she greatly appreciates it. But, I’m the more practical type of guy too. I like to do something that will bless her on her special day, but continue to bless her many days down the road. So, I’m always keeping my eyes open for some way to do that. A number of years ago, I came up with a great way to do that. On the north end of our barn, we have a big sliding door that opens so that we can put the cows out on the barnyard and out to pasture. In the summer time, we like to leave that door open, so that fresh air can move through the barn. The door way frame was originally built, so that a heavy pipe gate fit into the frame. That way, if a cow got loose in the barn on her own, she couldn’t run out to pasture. The pipe gate was made of heavy two and one half inch pipe. It was super strong and super heavy. It needed to be, because once in a great while, a big cow or heifer would get riled up and jump over the gate. Usually when the cow was half way over the gate, she would have roughly 1000 pounds of weight on it. That big old heavy gate never bent though. There was one problem with it though, because of the weight, it was difficult for Joanne and the kids to take on and off. They never ever complained about it, but I could see it would be wonderful if I could do something to change it. I really liked how the builders had designed it; I just didn’t like the weight. So over time, I gave it a lot of thought and came up with what I thought was a good idea. We always had to wait for Joanne to leave the farm, before we could start to work on it. I also had to get some material on the side without Joanne knowing about it. We eagerly worked on it every chance we got. It didn’t go as easily as we had planned, but in the end we had a beautiful piece of work to be proud of. It weighed about 15% of what the old one did. Well, on the special day, we gave it to Joanne. The kids and I were excited to give it to her. She was totally surprised, almost speechless when she saw it. She never had a clue what we had been up to. It was so much lighter and easier for all of us to handle. Over the years, she has been very thankful for it, and has always remembered how her loving family blessed her one special May. We all like it; it’s a gift that keeps on giving. That’s usually the best kind in my opinion. Yes, since then, one big heifer did go over the top of it. It sprung it a tiny bit. We had to do a little bit of work on it to get it back perfect. So it has stood up all these years and been a blessing. Every time Joanne takes the gate on and off, she remembers that she is greatly loved by her family. I’m glad we could bless Joanne in a very practical way. She sure liked it, although I also know that she likes flowers or something else special with it too. Husbands, on Mother’s day, or your wife’s birthday, do something special for your wife. Show her that you love her. In doing so you will bless her and fulfill the Scripture in Eph. 5:25 that says, “Husbands, love your wives.” Give of yourself to her and you will both be blessed. Tom Heck, his wife Joanne and their two children, Catherine and Joshua, own and operate a 35 cow, 159 acre dairy farm in northwestern WI. 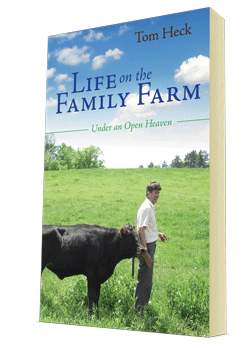 Contact Tom at: lifeonthefamilyfarm@gmail.com Copyright © 2012 by Tom Heck. All rights reserved.